If there’s anything that Bodum is famous for (apart from their uncanny design talent), it’s their range of French pressed tea and coffee makers. First introduced in the ‘80s, they are now a signature part of Bodum’s range, being made from heat-resistant borosilicate glass with fanciful metal housings. 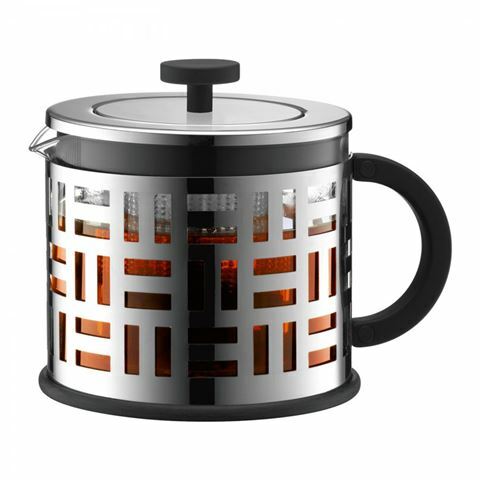 Playing with a boldly geometric style in polished stainless steel, the Eileen French Tea Press features a spacious filter that lets the tea leaves swirl freely and develop their full aroma. Once your desired strength is reached, press down the plunger and the tea leaves will get locked at the base of the filter, halting the brewing process. All that‘s left to do now is pour the delicious tea into your favourite mug, pop your feet up and enjoy! Outer housing made from stainless steel and heat-resistant nylon. Capacity: 1.5 Litre (12 cups).